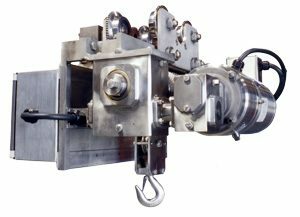 One of the country’s largest processors of pork has replaced its traditional painted chain hoists with all stainless steel wire rope hoists from David Round. The processor was experiencing very short product life, replacing hoists every 6 months with its previous hoists, due to the highly corrosive environment from the brining process. The new David Round stainless steel hoist has performed reliably for over 5 years without replacement! The David Round Company engineers and manufactures many different stainless material handling equipment. From hoists and trolleys to floor cranes, we can find the perfect clean solution for any food processing.